Nostalgia seems to not upset people like politics does. I’m prone to get very heated-up when trying to have an otherwise calm discussion about life and politics. Sometimes it seems that I was born out of step with time. There is very little of today’s laid-back, don’t-give-a-damn national attitude that I endorse. I’m scared to even consider what lies in wait just around the next bend in time. So let’s just reminisce about days gone by. The past, after all, isn’t something you’re likely to mess up, whereas the future has almost limitless possibilities. Things mechanical have always fascinated me. Most kids raised on or around farms get exposed early on to gears, pulleys, and all sorts of machines. I was an accomplished John Deere driver and fixer long before I started driving my uncle’s 1951 Chevy. It all just snowballed as I got older. One of my best memories was the day I saw my first Whizzer motorbike. To a young feller my age it was a wondrous mechanical marvel and a thing of manly beauty to boot. After I once laid hands on it I was smitten. I had heard the siren song. The smell of gasoline and oil took on a new meaning in my life. That little motorbike belonged to a kid who came up from Birmingham every summer to stay with his grandparents. Dudley Prescott, or Dude as we called him. Dude liked to visit with my Uncle Buck’s kids and actually spent more time at their house than with his grandparents. On this particular visit his folks let him bring the Whizzer with him. Something I’d bet grandma and grandpa wish hadn’t happened. Just too much mobility for a young kid. At any rate Dude went to my uncle’s place and before long he and my cousins put their heads together and came up with a way for everyone to benefit from the motor bike. My cousin Charles used a long rope to tie the Whizzer to an old, well-worn RollFast twenty-four inch bike and “Bingo,” it was road trip time. By taking all the right roads you could travel in a big eight mile circle and wind up back at my uncle’s farm. The plain was simple enough — just go in one big circle. Two on the motorbike pulling two on the old pedal bike. What could go wrong? Strange how assorted bugs can show up at what is not always an ideal time or place. By the time all the boys and the two bikes showed up at my house they had run the gauntlet of things that could go wrong. For starters, they ran over Aunt Nell’s tulip beds in the front yard. They ran over a rooster and one old sow pig that darted out of the roadside weeds and into their path. The rooster wasn’t a big deal, but the pig was an attention-getter. The foursome had been cured of all desire to dodge every sort of obstacle and not get hurt. I became a lover of motorbikes from that day on. 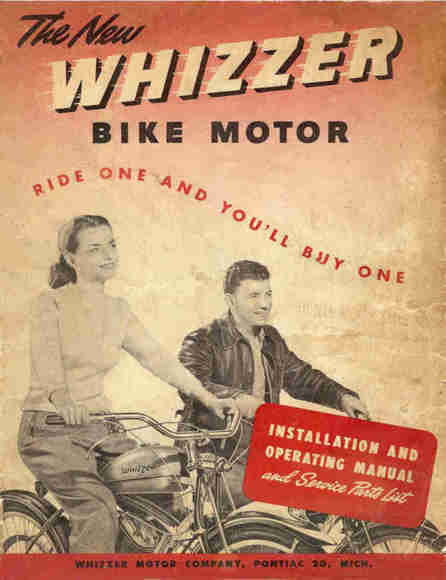 Later I was even lucky enough to own a Whizzer exactly like the one I saw on that day long ago. The little bike became a collector’s item after the factory closed in 1953. Someone else must have loved the Whizzer and bought the name because the little bike is now being built in China. The price of a new one is most likely much more than the original, which was $299 for the Sportsman model like the one told about here. There was a heavy-duty Schwinn fitted with a motor and ready to roll for $50.00 less. For the really thrifty, there was an engine-only kit for people who wanted to convert their pedal bike to motor power. The cost was about $90. Believe it or not, I had the chance to tour the small Whizzer plant before it closed, and I met people who became my life-long friends. Life is sort of strange and unpredictable but seldom dull. By the way, wind-driven power systems aren’t that new. Even though I joke about electric windmills, my granddad used one in the late forties and early fifties to charge batteries so his house radio would work. He hadn’t yet got electricity on his farm. The thing was called a “Wind Charger” and was mounted on a windmill tower. Not a new idea by any means. Thought I’d throw that in for those of you thinking Green. You have a wonderful ability for storytelling and apparently had a life that left you wealthy with anecdotes. I just wanted to thank you for sharing you’re colorful life with us. I don’t remember Whizzers, but I must have seem some older ones around. I do remember a kind of motorcycle that a few of my friends had when I was a teenager. They were pretty basic machines, with some kind of slipping clutch or drive belt which meant there was no gear-shifting required. I wanted one very badly, but alas, it wasn’t to be. Larry – I just finished restoring a 1947 Whizzer Pacer. At 2.5hp and a maximum speed of approx. 20mph, do you know if it needs to be registered for operation on a New York State road? My local DMV was oddly unable to define the eligibility of this ‘motorized bike’. Ed, if you’d like, send a photo of your Whizzer to editor@opinion-forum.com and we’ll post it here.